Calculus-Based Physics I by Jeffrey W. Schnick, Ph.D., Saint Anselm College is licensed under a Creative Commons Attribution-ShareAlike 4.0 International License, except where otherwise noted. 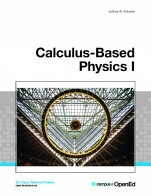 It is therefore not necessarily intended to be entirely comprehensive for all introductory calculus-based physics courses, but does indeed cover with depth the majority of topics required for such a course. There is no index or glossary. There is only a simple table of contents. Most introductory physics textbooks begin with some discussion on physical quantities, units, sizes, etc., but this text delves right into conservation principles-after discussing some mathematical concepts. It may benefit from a short introduction for students who have little or no background in the sciences to get a feel for the physical quantities involved. Most of the discussions on units, dimensions, problem solving, etc, are, however, conducted within the topic chapters. At the beginning of each chapter is a preamble about the potential misinterpretations and mathematical errors that are common with the given topic. This is useful in addressing misconceptions students may have about the given topic before getting into the details. The definitions and explanations of new topics is generally quite short compared to a traditional calculus-based physics textbook, but this is also consistent with the author’s idea to “maximize on-time reading”. Though there are no exercises within this textbook, the author has provided ancillaries in the form of exercise sets following the ordering of the textbook, with solutions provided in video formats and .gif files. There are also in-class multiple choice questions (no solutions), ideal for clickers, online questions (with solutions), blackboard ready online questions, class syllabus, and more. All of these can be found here. Chapter 37: The First Law of Thermodynamics (No reference to any specific thermodynamic processes, gases, etc.). Chapter 2 provides a good overview of how to solve “physics” problems with examples and the example cases for conservation of mechanical energy are quite useful. Chapter 22 has a good set of examples of the same problem, but as with some other chapters, students will likely request further examples analyzing different situations. Chapter 29, pgs. 213-14: Derivations are avoided for lengthiness and only results are provided, without proof. This may be adequate if professors who need to demonstrate proof can do so using other means. Having only reviewed the text and not the separate ancillaries, there are no obvious issues with the accuracy of the content in the text. Often-times, the footnotes provide additional detail, completing and clarifying the content in the main body of the text. The topics themselves are no different than other calculus-based physics textbooks, which have been the same for at least a hundred years. The majority of the examples use abstract objects, such as “particles”, so they are in no danger of becoming irrelevant over time. There is, however, very little connection to “real-life” applications, which is something students often crave for motivation. Most of the examples are rudimentary problems found in any physics textbook of similar level or less, without much connection to more common or less idealized situations. It is usually fine to begin with such examples, but less abstract examples are usually then shown to demonstrate its usefulness. As conservation principles are discussed first, rather than topics such as Force and Newton’s Laws, it may be difficult to change the ordering of the early topics given a particular instructor’s preference. It seems, however, that this is the direction that most new introductory physics textbooks are taking. Since the book begins with chapters on conservation principles, many new terms are used, but these are always explained. There is, however, a danger in overwhelming a student without any previous knowledge of, say, energy, momentum, inertia, etc., to learn about these terms and their equations without knowing the depth to which they will be addressed later on. In principle, it has been shown to be a good idea to place emphasis on the principles of conservation in physics, rather than defining terms such as force and Newton’s Laws, but it’s not clear how all students may react to reading these first few chapters with all of its terminology. An example is on pg. 18: The potential energy of a spring is given without any explanation as to its origins. Discussing “Work” beforehand would allow for this, but the ordering does not allow for this here as these initial chapters are only meant to cover conservation principles and “Work” is not discussed until Chapter 24. The same can be said about the rotational kinetic energy. This is a calculus-based book and it does show how the integration of small elements of mass and their distance to the center of rotation give the moment of inertia, and thus the rotational kinetic energy using the explanation of angular velocity, but this isn’t covered until Chapter 22. Additional illustrations and even further spacing would be helpful in clarifying many somewhat complicated conceptual examples written in dense paragraph form. The concepts are generally well explained, but many would benefit from an illustrative example that complements the idea being expressed in the text. Many times, mathematical frameworks are introduced, such as the cross product, dot product, vector use, etc., before they are needed. It is generally more useful for the reader to get the mathematical framework for something as needed, rather than introducing it first and maybe (or maybe not) applying it later. Instead of addressing “vectors” as a separate topic-as many textbooks do-they are explained as they are needed in solving problems, such as vector addition in “Relative Velocity”, its properties in “Gravitational Force…”, and determining vector components in “Projectile Motion” problems. There is perhaps a danger for students in abstraction of what vectors are without realizing their relevance and universality in many topics at once. The use of arrow subscript notation to represent vector components rather than the more typical x, y, or z used in other textbooks is fine, as it is done consistently. It is the rare exception where a step in a mathematical derivation is not completely transparent. The word “system” is used consistently from the beginning, but there is never a clear definition of what a “system” can or can’t be. In Chapter 2, on pg. 12, the introduction of a “force” using the unit of Newtons with respect to the gravitational field strength units in the gravitation potential energy equation, is a bit of a strange way to introduce this key topic, but it is consistent with avoiding the definition approach of force, energy, etc., and focusing on conservation principles. In Chapter 14, pg. 82, there is a good discussion on Newton’s third law, in particular with the example of a broom, but this could again be clarified with a simple illustration. In Chapter 15, pg. 90, a concept like the spring force or “Hooke’s Law” would benefit from using graphs to show the linear relationship of the variables involved, rather than just saying that they are linear or “directly proportional”. In Chapter 15, all of the situations involving free body diagrams have the “victim” as the same object for all the forces, so it seems redundant to use that extra term perhaps. Chapter 17: The derivation of the gravitational force between two masses is derived from the gravitational field and Newton’s second law, which is much more transparent than how many textbooks simply state Newton’s “law of gravity” as a truth in and of itself. Chapter 17, pg. 109: The expression for the gravitational potential energy is simply stated here without any proof, but the derivation is done properly in Chapter 25 using work-energy principles, as well as the derivation of other expressions that were simply stated in Chapter 2 without justification. Chapter 19, pg. 118: The language used to describe a rotating rigid body and the different particles that make it up is a bit confusing. Another place where a simple graphic would help illustrate the situation. Chapter 21: It is not clear why cross product matrices are discussed in Chapter 21 without their use in any subsequent topics or examples. Chapter 29, pg. 202: The misconception that material of the string is moving along it can easily be illustrated with a particular point on the string in the graphics of pgs. 202-205. This is done in subsequent pages regarding the wave velocity. There is good consistency in the types of explanations, the terminology used, and the mathematical framework applied. It would be useful to always provide some interpretation or discussion of the results after an example is provided, which is one of the key steps mentioned at the beginning of the text for any physics problem. This is often done after a derivation, but not consistently done with example problems (See for example pg. 24: Example 4-2). There are cases where simple examples are used, that then lead up to more complex ones, and other cases where a more complex example is used at the very beginning. It would be nice if there were some more consistency with the level of difficulty in the examples provided, as the student progresses through a given chapter. See for example Chapter 20, Example 20-1. This text is ideal for modular use as few times are equations and figures referenced, but are rather re-stated. There are quite a few large, dense paragraphs, but these typically have appropriate sub-headings. It is the author’s intention that instructors edit and rearrange content as needed, and this is easily done, for the most part. As stated earlier, the order of topics differs slightly from traditional introductory physics textbooks in that it addresses conservation principles first, but then refers to them as the more traditional order of topics is addressed. The sometimes long, dense paragraphs can interrupt the flow, especially without the use of illustrative figures that could complement the text. The figures are quite basic and are intended to be edited easily, as with equations, in the MS Word version of the text. No significant issues were found with the text in PDF or Word format. Having a linked table of contents would be helpful for these electronic versions. As the author states, this is indeed a "starting point" for an introductory calculus-based physics course. It certainly leaves out many details that many denser, more traditional textbooks contain and it would perhaps be useful to use one of those traditional textbooks as an additional reference in the course, for the student and instructor alike. The textbook is, however, a very good starting point for an instructor to begin modifying for use in their particular course, and given physics education research results showing the importance of the emphasis on conservation principles and clear conceptual explanations with terminology provided as needed, this textbook takes a very good approach to almost all the topics it addresses. Particularly for students, there are very good, concise explanations of topics that would be ideal for reading prior to more in-depth analysis in class, as intended by the author. The large amount of ancillaries provided should also not be overlooked, as they are consistent with the organization of the textbook, with both in-class and online exercises, with solutions. The textbook is certainly appropriate for use in Canada, and elsewhere. This text does cover all the standard ideas for a first year physics textbook: Motion, Newton’s Laws, Work and Energy, Waves and Thermodynamics. This is more a series of very well written lecture notes or theory than a textbook. The diagrams are clear, simple black and white sketches. To be a more useful textbook it needs many more written examples and more examples from everyday life and more textbook questions and problems. Problems are included in other files, and the solutions to those problems are available in a variety of formats. That is very useful, but it makes it difficult for a student using the textbook to check their comprehension. They have to go back and forth between three different files. Those problems files are labeled “SAC102” as opposed to by topic. That was a deliberate choice by the author so that the problems would always stay the same, but it is confusing. If the files had a topic name that would help. There is no index or glossary in Calculus Based Physics I or Calculus Based Physics II. The author clearly thinks of the two books as one long book, or a book in two volumes so I felt it was appropriate to mention both books here. The content is accurate, error-free and unbiased. This is more a series of very well written lecture notes or theory than a textbook. The diagrams are clear, simple black and white sketches. What is there is very clear and accurate. As an example of what I found odd the first example of using integration in full with a moment of inertia problem had a non-uniform mass distribution. That is difficult for students to visualize. As a second or third example it would have been fine. What was presented was accurate and error-free, but I think it would be confusing to the students. One of the many joys of physics is that the basic first year science changes very little year to year. The content in the book is thus up-to-date. The text is written and arranged in such a way that necessary updates will be relatively easy and straightforward to implement. I particularly liked the fact that Einstein’s theory of relativity is mentioned right at the start with a clear explanation of why ordinary day-to-day speeds make it unnecessary to take relativity into account. The text is written in lucid, accessible prose in general. This textbook is a very bare-bones and straightforward presentation of basic physics theory. Some of the sentences tend to run on. The first chapter is a review of some of the mathematics needed to understand the rest of the textbook. Chapter Two is the first physics chapter. The very first and very long paragraph in starts with the sentence “Physics professors often assign conservation of energy problems that, in terms of mathematical complexity, are very easy, to make sure that students can demonstrate that they know what is going on and can reason through the problem in a correct manner, without having to spend much time on the mathematics.” The long paragraph ends with the clear statement if students focus on clearly communicating the solution they will often do better than those students who “just try to get the right numerical answer.” A lot of prose to get to this important point. I think too much prose for many students. The author uses a lot of parentheses. I found that they interrupted the flow of the words and rarely added anything useful to the content. The textbook is clear of jargon but the associated questions contain statements such as “The driver of the boat … at full throttle, with the rudder aligned with the keel .. “ Without a picture of a boat, or a rudder, or more explanation of these words, these types of questions would be hard for many of my students to understand. Yes. This is a very clear presentation of basic first year physics. I found it odd that it started with conservation of energy in chapter two and then deals with energy next in chapters 24 and 25. Yes. This textbook starts with conversation of mechanical energy and then returns to this topic in chapters 24 and 25. While I personally like starting with conservation laws, I think it would have benefited with a longer explanation about conversation laws in general and energy in particular. The text could easily be reorganized and realigned with various subunits of a course without presenting much disruption to the reader. It was clearly written with modularity in mind, and does that well. You could easily start with Chapter 6 One-dimensional motion for example. I think it needs more of a mathematical review to be a stronger stand alone text. This textbook, like most first year physics books, follows a fairly standard list of topics that easily be reorganized if another faculty member wishes. As stated earlier I found it odd that it starts with conservation of energy and then does not mention energy again until Chapters 24 and 25. Even with having too much in the first three chapters with not enough examples, in my opinion, it is still logical and clear. The few graphics and graphs were clear and easy to read. They were clearly drawn with the idea to use a black and white printer and to be easy to photocopy. The printed text was free of any errors with formulas. I use a MacBook Air and when reading on the screen I would occasionally have misaligned or difficult to read formulas as some of the symbols would not display. I got "document not found" errors at few times. As a Canadian I found the number of examples and questions that involved shooting bullets was a little off putting. On page 110 the only example in this chapter on universal gravitation was “How great would the muzzle velocity of a gun on the surface of the moon have to be in order to shoot a bullet to an altitude of 101 km?” Now it is sometimes difficult to separate culture from jargon but I was a little taken aback by the bullet question and that it contained words such as “muzzle velocity” and “altitude”. Yes it is easy to look these up in a dictionary, but a few more words would make that unnecessary and easier for the a student who has never fired a gun to understand. Why would anyone be shooting a gun on the surface of the moon? Throw a rock or fire a rocket seem a little more likely to me. Before I would consider adopting this book for my first year college course it would need a lot of additional background material to match what most of my students bring to my first year course. It needs more in the first mathematical chapter, specifically a much longer introduction to derivatives with many more examples and graphs. The author is very clear that this is to be used by students who are taking a calculus course at the same time, but about half of my students have already taken calculus at a variety of institutions so they need a clearer review or explanation than is given here. There were no examples of acceleration that changes with time, so no use of derivatives or integrals until page 145 and the moment of inertia chapter. For a calculus based physics book I would have liked more calculus throughout the book. This is the main flaw of the book to me, and I will hesitate to adopt it for this reason. I will recommend it as an alternate for my students, but not as the main textbook. As to Canadian context, a quibble about the use of mph or miles per hour in the motion chapters. The metric or SI system is used throughout the book so this is a quibble, but it did stand out. The book does not cover the material appropriately. Some important topics are omitted from consideration. Some are presented at a too basic level. The course starts with conservation laws, which assume the previous knowledge of the subject. Dynamics starts with gravity force without proper description of interactions in general. Poor introduction of other forces. Poor description of free body diagrams. 2D quantities are not introduced properly as vectors. The concepts of 1D motion are represented too basically. Lots of energy is gone into a discussion of intuitive meaning appropriate to high-school level students. Some errors are present. More editing is required, especially in the formulas. Mathematical prelude does not correspond well to the calculus based content. No references to the real life situations. Very few examples are provided. The text is out of context completely. The nice feature is a warning at the start of each chapter. However, it refers to the material that the students are not supposed to be familiar with yet, so the efforts are wasted. Some topics are not presented at the appropriate depth, some are gone into too much details, too long. Nonuniform circular motion is only mentioned. The text is not internally consistent. It actually cross-references itself a lot. Circular motion is presented using angular variables which are not introduced yet. The text can be divided into smaller section which are still not very useful for understanding the material. The topics in the text are not presented in a logical, clear fashion. Very few examples are given. The vector nature of some quantities is ignored. Poor correspondence to the appropriate level of math preparation. Moment of inertia discussion involves integral calculus. Waves involve differential equations. Interference is too quantitative. The pictures are very rudimentary. That is probably one of the reasons why there is no discussion about slopes in Graphical Analysis of one dimensional motion. Some errors are still present. More editing is required. Not all the important concepts are illustrated with the examples. Good description of cross and scalar products. Nice free body diagrams for Statics. End of the chapter problems would be nice. Overall the text is unusable as is.